Unlike the traditional FPL game, many of the moves I have made in FPL Draft have worked to my advantage. On the week I finished with 54 points, which took my up to second place, just 32 off the top spot. Prior to GW9 I claimed John Stones, Wilfried Zaha and Tammy Abraham, all of whom took their place in my starting XI. There has been no set formation for my draft squad, this week I ran out a 3-5-2 with the addition of Zaha and Abraham. Initially Aaron Cresswell got the nod, but illness sidelined up and Alderweireld took up the third defender spot for the weekend. Defensively, my squad fared well, led by Azpilicueta and his second goal of the season (7 points). I’ve doubled up with Man City, John Stones and Ederson recorded the clean sheet, combining for 12 points. It was the Spurs leaky defense at Wembley against Liverpool that saw Alderweireld with no return. Overall, I am pleased with my defense. If Chelsea can turn things around I will double up with David Luiz. On paper, my 5-man midfield looks solid. Although Dele Alli has been under performing, but this year has mirrored last year in terms of performance. Maybe this 9 point return is what he needed to kick start his run of returns. Still pleased to have Coutinho back, but he played uninspired football in their Sunday loss, but still expect solid numbers to come. 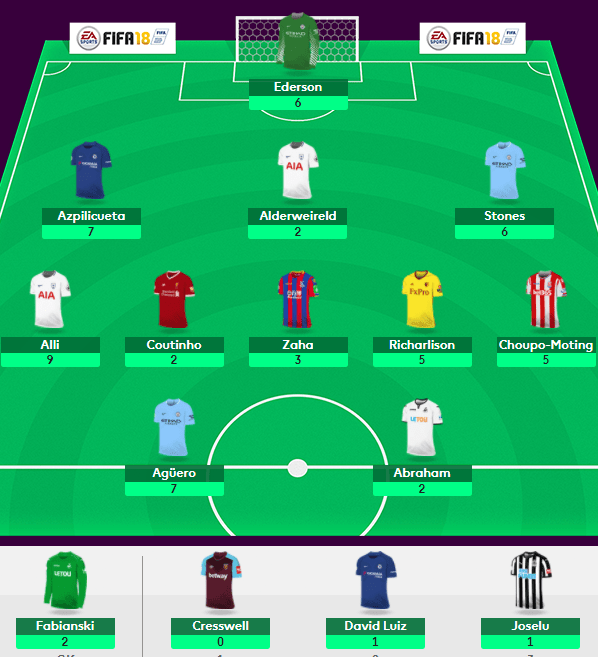 Last week’s transfers, Richarlison and Chuopo-Moting combined for 10 points, while newcomer, Zaha finished with 3 points. Not great, but really need Coutinho to up the offensive game. Up front I introduced Abraham to partner with Aguero, who got off the mark with a successful spot kick and bonus point. Depending on fixtures, I could see Abraham moved to the bench in favor of a 4 man defense as part of a 4-5-1 formation. On the week I have already put in a claim for Rooney, not sure he will remain part of my squad for any length of time, but in the short term Everton appear to have some good fixtures; lei/WAT/cry. Will have to wait and see if a new manager can reverse the poor start Everton has had this season. Next PostNext Premier League: What next?